Loren Kootswatewa is a member of the Sand Clan and lives near the Hopi village of Kykotsmovi. He learned his craft from his brothers, Emory & Wayne Sekaquaptewa. Later he attended school in Tucson, where he took art/jewelry classes, which helped him perfect his work in overlay and stonework. Loren is a man of many talents and a man of the world. 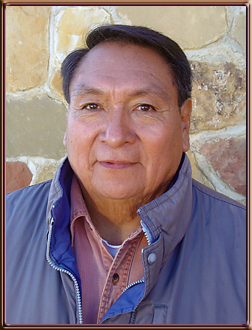 He has worked in the aerospace and defense industries and has lived in many locations throughout the U.S. For the past several years Loren has chosen to return home to Hopi. He is a learned man, accomplished in the ways of the Hopi and in many of the traditional Hopi crafts. Because he is often kept busy now working as a heavy equipment operator, he has specialized in making chains. This is how Loren feels about his work in his own words: "Hopi wisdom says we are all linked together through heart and soul. We are supposed to look out for one another. In all of our lives, we have a special link which keeps us together in our hearts and mind." As a result his hand made chains are extraordinary in quality. Each hand made link is exact and well proportioned and filled with spirit. As he so eloquently told us, "A part of myself goes into each piece." We always enjoy talking with Loren - he is a good story teller and a good man. He possesses the wisdom of the ages and has a great sense of humor. We are proud to know Loren, often ask his advice and are pleased to offer his work!